My parents are in the process of moving. While cleaning their basement my mom found my old board game, HeroQuest. The last time I played it was about 14 yeas ago! It was a 28mm miniature-based game produced by Games Workshop with Milton Bradley. Amazingly, all the pieces were still in the box! My daughter loves "spooky" things like goblins and monsters, so she is interested in playing. 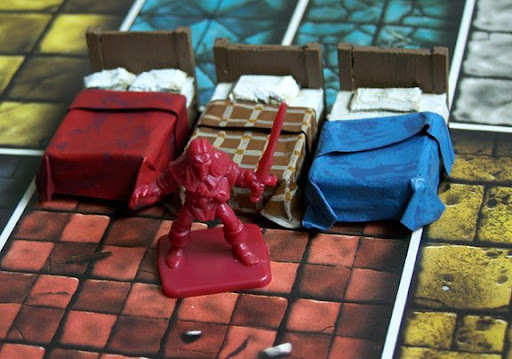 To add interest to the board, the game incorporates furniture. The two of us made some beds. My three are pictured above. She has yet to paint hers. Each bed is 1 inch long and .75 in. wide. I made them from two layers of 1/4 in. foam board (the kind with paper on each side), scrap wood, and paper. To make the blankets I soaked card stock paper in water, then draped it over the foam board. It dries to that shape. The pillows are also little pieces of foam board. It seems these beds are too nice to appear in a dank dungeon. It looks like some monster carefully made his bed before starting a busy day of eating adventurers. I'll have to try making rougher, unkept beds. The Song of Blades and Heroes Yahoo Group offers fan-made character stats for HeroQuest, allowing you to play the game resolving combat with the SBH rules. Indeed, HeroQuest's dungeon board, furniture and doors would be nice terrain to play the SBH supplement, Song of Gold and Dungeons. Mega Miniatures sold a wide range of some very charming 28mm Medieval/fantasy furniture. They are out of production now, but you can sometimes find them on eBay.